BodyLase® is the area’s leading medical spa and has been serving the Triangle since 2002. Our longevity is a testament to our happy clients, our outstanding safety record, our team of highly trained medical professionals and our exceptional customer service. We pride ourselves on being different from any other medical spa in the Triangle. At BodyLase®, all medical spa treatments are physician-supervised and performed by a licensed medical practitioner. In an industry where many providers have no medical qualifications, BodyLase® goes above and beyond to ensure our clients the safest and most effective medical spa treatments available. BodyLase® employs only highly qualified staff members and trains them under the highest standards of medical care and customer service when performing any med spa procedure. Our expertly trained, licensed medical professionals will help you to achieve the results you’re looking for. At BodyLase®, we will only recommend products and services that will provide the results you are seeking. We absolutely won’t recommend something unless we are highly confident you’ll get excellent results. When you walk through our doors, you enter a judgment free zone. You’ll be welcomed into a safe, accepting and comfortable space. Sometimes it can be intimidating to share your vulnerabilities. We understand because we have felt the same. 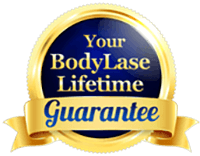 BodyLase® is committed to helping you look and feel amazing now and for many years to come. You’ll receive a personalized treatment plan, ongoing Laser Guarantees, VIP Membership programs, and more. BodyLase® is proud to have been awarded Diamond Level Status with Allergan, the makers of Botox, Juvederm, and CoolSculpting. This means our medical spa is in the top 2% of all practices in the USA. In fact, BodyLase is in the top 500 out of 35,000 Allergan practices in the country. This distinction further validates BodyLase’s extensive expertise with these leading medspa treatments. You can be confident that your BodyLase® practitioner has been trained in the latest techniques in injections, lasers, and all medical aesthetic treatments. BodyLase® invests thousands of dollars each year by sending our staff to advanced training seminars. All BodyLase® CoolSculpting providers have attended CoolSculpting University for advanced training. Sometimes, because what we do is fun, clients can forget that aesthetic medicine is exactly that – medicine. All procedures can carry risks. BodyLase® is proud to say that we perform all procedures under the strictest and safest of conditions and we use all recommended protocols to ensure your treatment room and equipment are sterile and sanitized. When it comes to your health and safety, BodyLase® will not compromise. Vast Array of Cutting-Edge Technology – BodyLase® has the latest, most up-to-date equipment in the industry so you have access to many different types of aesthetic treatments. For example, we have multiple lasers for many different skin types, the latest in CoolSculpting technology, and always stay current with what’s new in the industry. BodyLase® is locally-owned and operated by a Raleigh physician family. This matters because the owners care about the company and its clients. BodyLase® offers a no-interest payment plan through Care Credit. You can pay for your BodyLase® packages with low monthly payments over a one year period with no interest. It couldn’t be easier! BodyLase® is the only medical spa in the Triangle to offer a VIP Botox® Membership, which allows you to get Botox® at discounted pricing and offers low monthly payments. In addition, the Membership Program is loaded with other perks such as discounted laser treatments, fillers, and retail products. The BodyLase® Botox® Membership is one of the most popular features for BodyLase® clients! *By providing my phone number above, I consent to receiving calls and text messages from BodyLase regarding appointments, marketing, and other information.